What is a lens diaphragm and what purpose does it serve? Camera lenses have different levels of light-gathering power (or aperture ratios) – in other word, the ability to transmit varying amounts of light. Inside a lens there is a special device which regulates the diameter of the aperture (opening), allowing light to pass through to the light-sensitive element (image sector) – this is called a diaphragm. Illumination is effected by the relationship between the diameter of the lens aperture and the focal distance. Lens speed (indicated by the letter F) is the reciprocal correlative relationship between the focal distance and the diameter of the entrance pupil (aperture). Different sources provide varying ways of measuring lens speed and with diaphragms the f-number 2.8 can also be written as f/2.8 or f:2.8. By changing F by one degree (or f-stop) we get a change of 1.4 in the diameter of the diaphragm’s aperture. The amount of light falling on the image sector changes by x2. There is a standard range of F values – 1.0, 1.4, 2, 2.8, 4, 5.6, 8, 11, 16, 22, 32. When the lens speed is high the camera can be set to a shorter exposure time. This is an advantage when shooting moving objects. A high lens speed is also a plus in low-light conditions, for instance, when taking photographs inside a building in the evening – at a party, concert, etc. Depending on the type of camera, it is possible to set the desired diaphragm manually via the camera’s menu by rotating the control wheel on the body of the camera or by turning the diaphragm ring on the lens itself (not found on all models). In all instances the result will be the same – an increase or reduction in the diameter of the aperture which lets the light through. What effect does changing the diameter of the aperture have? The smaller the aperture of the diaphragm, the greater the depth of field (DOF) – the DOF being the area in sharp focus around the object being photographed. DOF depends on the diaphragm, focal length, distance to the object, and also on the size of the image sector. Adjusting the diaphragm is the most effective way of controlling DOF. When the lens speed f-number is low, the diaphragm is large. 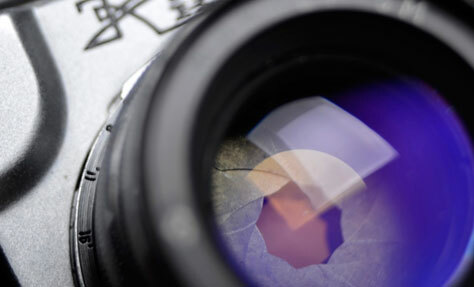 The diameter of the lens aperture is wider and more light falls on the image sector. Maximally open diaphragm – “petals” are fully open and the f-number is f/1.4, f/2.8, etc. (depending on the camera model). For example, the lens is 55mm f/1.8 with a maximum diaphragm of 1.8 (aperture large), and a minimum diaphragm of 22 (aperture small). This means that on a large diaphragm with a small value of 1.8 the depth of field will be small, but on a small diaphragm with a large value of 22 the DOF will be maximised. In addition, it is necessary to reduce exposure time more with larger diaphragms. If you want to blur the background and emphasise the main object then a large diaphragm is required, in other words a small f-number. The depth of field will be small and the crossover between the blurred area and the area in focus will be visible. The lower the f-number, the smaller the area in focus will be. This is good when, for example, you want to “hide” an unattractive background. For a portrait you can set the diaphragm to f/2.8 then the subject’s face will be in sharp focus and the background blurred (provided the camera is properly focused on the face). A narrow aperture of a “constricted” diaphragm lets in little light. What’s the advantage in this? With a constricted diaphragm you get a large area of the frame in focus. The main area of the shot will be in focus, the background will become clear and perceptible. If you are shooting a landscape or subject, where everything must be in sharp focus – architecture, panoramas, still life, interiors – then you should select a small diaphragm (reduced aperture, higher f-number). With constricted diaphragms of f/22 or f/32 depth of field is maximised. Try to bear in mind that at the extremes of the f-number values most objects won’t give you the best photographs. Therefore, the very ends of the f-number range are best avoided. Depth of field is one of the expressive mediums of photography. As a rule, classical portraits are shot using a small DOF. The object stands out from the background and all the viewer’s attention is drawn to it. With close-up shots the distance to the object is very small and because of this the depth of field, even with a constricted diaphragm, will be only a few millimetres. Therefore, important details can turn out to be out-of-focus. Here, it’s necessary to find the correct point of focus in order to achieve the largest possible depth of field.